Survey says? If there was one done on how many people know what kombucha is, I’d have no idea what to guess. I find kombucha to be the wild card of healthy beverages. To me, it feels like kombucha is one of the most known and unknown products in the wellness world. I learned about kombucha many years ago, but my life centers around these things. Sometimes I am drinking kombucha and people look at the bottle with a confused look on their face and say something like “what the heck is that?”. And then there are times I’m going to buy some kombucha and the store is completely sold out. Which makes me wonder -- is kombucha a product with longevity? A trend? In between the two, or neither? When I first learned about kombucha and all of the health benefits of drinking it, I started to have it occasionally, but naturally lost interest. Then a few months ago I came across Suja’s kombucha line and I fell in love, specifically with the ginger lemon kombucha. “All ginger everything” is my motto, so this was a jackpot find. If you love green juice and kombucha, a must have is Suja’s super greens kombucha. Now I’m drinking kombucha once a day (if it’s not sold out) and the two things I notice most are better digestion and more energy. Slightly acidic and bubbly, kombucha is an ancient fermented tea beverage that is typically classified as a functional beverage. It has been around for thousands of years and is believed to have originated in China, traveled throughout Asia and Russia and eventually became a health trend in the West. Kombucha is prepared by placing the kombucha culture into a sugared tea broth for fermentation. The fermentation process of kombucha makes it rich in probiotics. The base of kombucha tea contains four ingredients: water, sugar, tea, and a kombucha starter culture (SCOBY), an acronym for symbiotic culture of bacteria and yeast. It starts out as a sugary tea, which is then fermented with the help of a scoby. The scoby bacteria and yeast eat most of the sugar in the tea, transforming the tea into a slightly sour and fizzy fermented (mostly non-alcoholic) beverage. Commercial kombuchas must have less than 0.5 percent alcohol by volume, or they are considered an alcoholic beverage. Known for its energizing properties, kombucha contains B-vitamins --a blend of beneficial bacteria and probiotics as well as certain acids and enzymes that help with digestion. Gut health is a hot topic in the wellness world, and could be a driving force behind its rise to popularity in the mainstream world. Our second brain, which is located in our gut, is a fascinating aspect of the human body that is not well known, but is starting to get more attention. It’s a mass of neural tissues filled with important neurotransmitters that partly determines our mental state, and plays a key role in certain diseases throughout the body. Scientists are starting to discover that nerves located in our gut influence many emotions we experience, which is a major motivating factor in keeping our guts healthy, clean and functioning optimally. Incorporating more gut-healthy foods like kombucha into your diet helps keep your second brain full of the right bacteria it needs to function. Kombucha drinks are widely available in stores today in the grocery refrigerated section, usually near the fresh-squeezed juices and similar beverages. From basic flavors to exotic ones, there seems to be an option for every single taste bud now. My personal rule of thumb is to read the label and choose brands that use the least amount of additives. Black or green tea are the two most popular teas used to make kombucha so the majority of it does contains some amount of caffeine. 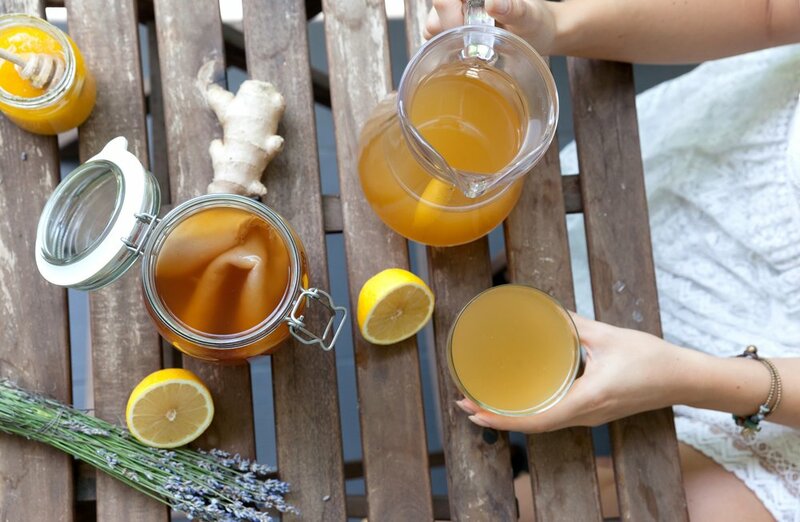 If you’re ambitious and wanting to channel your inner health hippy, you can make kombucha at home. Just be careful and follow guidelines as kombucha can ferment for too long or become contaminated when not made in a sterile environment. At first it may be a little complicated so if you’re a newbie, consider using a kombucha starter kit to make it easier. NutritionSuzanne Kvilhaug November 2, 2018 skvilhaug, kombucha, what is kombucha?, health benefits of kombucha, how is kombucha good for you?